Certification to NSF/ANSI 61 demonstrates compliance with nationally-recognized health effects standard for all drinking water treatment chemicals. 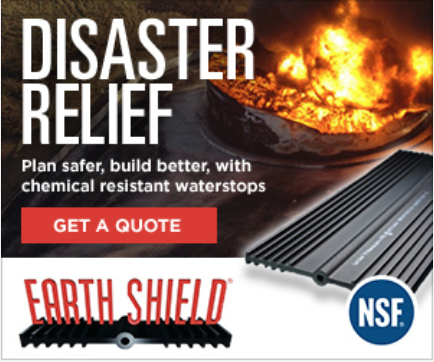 J P Specialties, Inc. has earned certification to NSF/ANSI 61, the American National Standard for Drinking Water Treatment Components – Health Effects for its Earth Shield® PVC Waterstop from global public health organization NSF International. Government agencies around the world utilize NSF International standards to verify the safety and performance of water treatment chemicals, pipes, and plumbing components and to ensure these products do not leach harmful levels of contaminants into drinking water. To earn NSF/ANSI 61 certification, J P Specialties’ Earth Shield® PVC Waterstop was subject to rigorous testing and evaluation to verify the product met requirements for use in drinking water. NSF International also audited J P Specialties’ manufacturing facility to verify compliance with the standard requirements. About NSF International: NSF International is a global independent organization that writes standards and protocols, and tests and certifies products for the food, water, and consumer goods industries to minimize adverse health effects and protect the environment. Founded in 1944, NSF is a Pan American Health Organization/World Health Organization Collaborating Center on Food Safety, Water Quality, and Indoor Environment.